Privacy, Security, Software Engineering, Public Policy. Dr. Annie I. Antón is a Professor in (and former chair of) the School of Interactive Computing at the Georgia Institute of Technology in Atlanta. 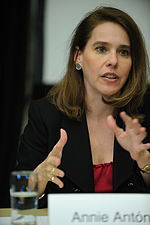 She has served the national defense and intelligence communities in a number of roles since being selected for the IDA/DARPA Defense Science Study Group in 2005-2006. Her current research focuses on the specification of complete, correct behavior of software systems that must comply with federal privacy and security regulations. In 2016, she was appointed by President Barack Obama to the 12-person bi-partisan Commission on Enhancing Cybersecurity for the Nation. Antón currently serves on various boards, including: the NIST Information Security & Privacy Advisory Board, and the Future of Privacy Forum Advisory Board. She is a former member of the U.S. DHS Data Privacy and Integrity Advisory Committee, the CRA Board of Directors, the NSF Computer & Information Science & Engineering Directorate Advisory Council, the IEEE Computer Society Research Board, an Intel Corporation Advisory Board, the DARPA ISAT Study Group, the USACM Public Policy Council, the Advisory Board for the Electronic Privacy Information Center in Washington, DC, the Georgia Tech Alumni Association Board of Trustees, the Microsoft Research University Relations Faculty Advisory Board, the CRA-W, and the Georgia Tech Advisory Board (GTAB).